Travel as far north west on the British mainland as the public roads will allow, then carry on, along wild mountain tracks, over a sweeping river and across a wide swathe of barren moorland and you�ll reach the tiny cottage of Strathchailleach. Sitting alone with only a bubbling burn and a few sheep for company, the squat building, with its thick stone walls and tin roof, lays claim to being the last lived in primitive dwelling in Britain. James McRory-Smith - Sandy to those who knew him - resided there for 40 years after turning his back on the hustle and bustle of life in the Clyde shipyards for an altogether more peaceful lifestyle. He lived the life of a hermit, with no gas, electricity or telephone, making only occasional forays to the village of Kinlochbervie seven miles away to collect his pension and stock up on life�s basic necessities. Just a few miles south of wild and lonely Cape Wrath, Strathchailleach is five miles as the crow flies from the nearest road and there's no convenient Land Rover track leading to the front door. The vaguest of paths can be found by those who know where to look. My first experience of Strathchailleach came late one spring night when myself and two friends happened upon it during an expedition round Cape Wrath. We'd been walking all day and a campsite free from ravenous midges was proving elusive. It was 11pm when we splashed through the burn and, wet and tired, chapped the flaking wooden door, uncertain if we�d find a welcome for the night. An angry roar from within suggested we wouldn't and we legged it over the hills. We ended up camping on the beach at Sandwood Bay where we watched the sun rise over the breakers. Back in civilisation, and a few weeks later, we read in a Sunday newspaper that Strathchailleach was the adopted home of McRory-Smith. He"d retired from his job as a riveter in one of the Glasgow shipyards and moved north in search of solitude. He would certainly not have been disappointed on that count. Apart from a few stray walkers and an eagle or two, few souls venture into this wilderness area. 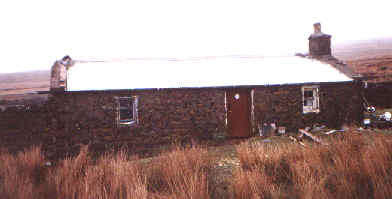 The years passed and I returned in the spring of 1999 on a work party organised by the Mountain Bothies Association. Back in 1981, their volunteers shed blood, sweat and tears to transform the building into a habitable bothy after one of the gable walls collapsed during a fierce storm. Sandy was huddling inside in his sleeping bag as the elements conspired to destroy his home. With the wall rebuilt, agreement was reached that he would occupy one of the main rooms and the other would be available for walkers to shelter overnight. Unfortunately, the old man was not particularly welcoming and over the years few joined him by the fireside for a dram. Sandy stayed there for four decades, making little contact with the outside world. Once a week he walked out over the water-logged hillside to the post office at Balchrick to pick up his pension. Then he bought food and batteries for his little radio at the London Stores on the road between Rhiconich and Kinlochbervie before tramping back in. There are tales of Sandy spending the odd night sleeping in the cells at the local police station, not for any criminal activities, but because the weather was too bad to make the return journey and he was guaranteed a bed for the night and a hot meal. Occasionally he would stop off at nearby Strathan bothy for a "night out". During his years at Strathchailleach, Sandy spent much of his time listening to music on his radio - his only contact with the outside world - and reading old magazines donated by friends. During the long winter evenings, he�d paint pictures on the bothy walls, mainly historical scenes or birds and animals. Some of his artwork remains. He took fresh drinking water from the stream behind the cottage and gathered driftwood from the beach to stock his fire. The grate not only provided heat on cold evenings, but was his cooker where he boiled pots of tea and baked potatoes in the embers. On fine days Sandy would hike up to the lighthouse to swap gossip with the keeper or make tracks to one of the area�s little lochans for a spot of fishing. But with the bothy deteriorating badly and with Sandy in his 70s and not in the best of health, he recently moved into caravan in Kinlochbervie. In the summer, with the sun beating down and not a cloud in the sky, Strathchailleach must have been an idyllic spot to while away the days. In the middle of winter, however, with snow on the ground, icicles hanging from the eaves and no central heating, few would have envied his no frills lifestyle. Venturing out for water would have tested the endurance of even the toughest of men. With the cottage vacated and little chance of Sandy returning, the MBA moved in again in the Easter of 1999. Materials were flown in by helicopter and over the course of a hectic week the bothy was fully renovated. The roof was completely replaced, as was much of the flooring. 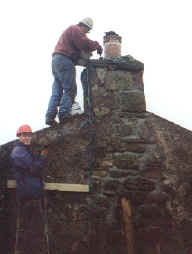 A new front door and windows were installed and the crumbling chimney was patched up to prevent it succumbing to the wind in the same way as the west gable had 18 years previously. With Sandy no longer in residence, the bothy's only permanent occupants now are the field mice living beneath the floorboards who pop up under cover of darkness to see if anything tasty has been dropped by hillwalkers seeking refuge. The resurrection, however, was tinged with a note of sadness. Shortly after completion, Sandy fell ill and was admitted to Raigmore Hospital in Inverness where he died, aged 75. He was buried in the tiny hamlet of Sheigra, just a few miles from his favourite spot. For more information on the work of the Mountain Bothies Association visit their website which is listed on our links page. Some of the information on this page was taken from articles written by Bernard Heath in the MBA newsletter.